Providing you the best range of fully automatic roller coating machine for textile industry with effective & timely delivery. We are one of the widely acclaimed manufacturers, exporters, traders and importers of Fully Automatic Roller Coating Machine. The offered machine uniformly deposits a coat of ultraviolet protection ink on sheet surfaces. Our offered machine applies a fully homogeneous coat of the ink which gets hardened when subjected to the ultraviolet radiation. The offered machine ink contains photo initiators which absorb the ultraviolet light through photoreaction process. 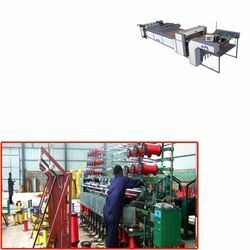 Looking for Fully Automatic Roller Coating Machine for Textile Industry ?